Figures released by the Foreign Office have revealed that tens of thousands of UK passports have been reported as either lost or stolen overseas. How many of them end up in the hands of criminals? You think of a passport as specific to you in every part of its design from the tamper-proofed photo to the biometrics of modern designs. When it's lost, if the security measures work, it should in theory be useless to anyone picking it up. That's not the case. Passports are routinely used for illegal activity. Most recently, two Iranians boarded Malaysia Airlines flight MH370 using passports stolen in Thailand. The authorities have said they had no links to terrorism, but at best, a clear security breach occurred - immigration controls failed to pick up a mismatching passport. 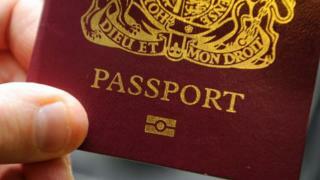 The sheer volume of UK passports that have gone missing worldwide is concerning to some. The latest figures - released under the Freedom of Information Act to the BBC's World At One - show 160,050 passports were registered as either lost or stolen abroad between 2008 and the end of October 2013. Spain is the biggest hotspot for lost British passports - 37,140 passports were lost or stolen over the five-year period. The figures show 16,082 went missing in the US and 11, 845 disappeared in France. Although the Foreign Office records whether passports have been either lost or stolen, they were unable to say how many fell into each category, as this would have involved manually checking each case. Many of those that are lost may well end up being thrown away or destroyed. But a proportion end up in the hands of crime gangs. "This has the potential to be circulated among either organised criminals or among terrorists," says Dr David Lowe, an expert in global crime, security and terrorism, based at Liverpool John Moore's University. "I'm not saying that the whole 160,000 will be, but you only need a very small percentage of that to cause a problem." Passports are like "gold " to criminals, says Tom Craig, a security expert and former Scotland Yard fraud officer for 30 years. Certain criminals require passports other than their own to perpetrate crimes. For drug smugglers and human traffickers, who regularly cross international borders, clean passports are vital. They might risk enhanced surveillance or even arrest travelling under their own names. The 9/11 attackers used stolen passports in what is perhaps the most infamous case of identity documents being used to perpetrate crimes. "Having a passport, that's like the key to the door, that's like knowing the combination of a major bank of England safe that allows you access to whatever people want to see, making you a bone fide person," says Craig. "It proves to a certain extent who and what you are and what nationality you are." And then there is the more widespread issue of identity theft. "I've come across numerous cases where bank accounts have been opened, where mortgages have been obtained, people's lives have been ruined by people taking on their identity and committing all sorts of crime all over the world. "I know of several cases where bone fide people have been arrested when they've turned up at airports out of country and have been arrested because they think they are the criminal, when in fact they're not the criminal - somebody else has been using their identity." Passports lost in certain countries may be more likely to end up in the hands of wrong-doers. "Certainly for the UK and Europe, when you're looking at the North African countries around the Maghreb, the Middle East and going across towards Pakistan and India, these would be a potential problem for the UK because they [terrorists] have been targeting the UK, the USA as well as other states in the European Union," says Dr Lowe, a former Special Branch counter-terrorism officer with Merseyside Police. The figures reveal that 4,377 passports were reported as missing across countries in the Middle East and North Africa. A quarter of them were lost or stolen in the United Arab Emirates, and the tally for passports across Morocco was 412, Libya 86 and Tunisia 164. In south Asia, 3,288 British passports were reported as either lost or stolen. Of these, 1,746 went missing in India, 838 disappeared in Pakistan and 159 in Afghanistan. Craig says that stolen passports could be sold for between £500 and £1000 depending on the passport's expiry date and the extent to which the photograph looks like the new owner. Sometimes stolen passports may have the photo tampered with to make it look like the recipient. "I know from my own investigations, when we were looking at different groups, you would find fraudulent documents from passports which have been lost or stolen and they would be doctored to have a new photo in," says Lowe. On other occasions, the criminals may just rely on lax immigration controls - security officials simply not looking closely enough at the passport image. But Craig says criminals would find it difficult, although not impossible, to use the passports to get into the UK, because of increased passport and border security controls. "If you are organised criminals or terrorists, you will try to find an obscure airport that doesn't do as much checking as a large airport does. Or you will try to find somebody who can be bribed or colluded into not doing the proper checks," he added. Craig says the fact that passengers were able to get on to the Malaysia flight highlights a serious flaw in the system. "It's exposed a loophole in relation to how documentation is checked at border controls or through the private sector such as the airlines allowing people on to the airlines when their identity has not been properly checked." He added that if non-law enforcement agencies such as banks, airlines and legitimate fraud investigation services could access data on lost and stolen passports security could be significantly increased. Recent events may end up providing the impetus for a fresh look at the problem.